Slip into crisp, clean sheets, crack open a new novel, and set the stage for drifting into dreamland. Slipping into slumber can be easy, thanks to the calming and relaxing aromas of the right essential oils. When it’s time to go to sleep, these essential oils are the best to have around for transforming your bedroom into a tranquil haven for rest. Like a gentle breeze over blooming fields, Lavender essential oil is calming and fresh. It’s the ideal companion for bed linens and one of the best essential oils to apply before you go to sleep, as its soothing aroma is mild and relaxing. Try Lavender essential oil applied to the bottom of your feet before bed, or mix the oil in a spray bottle with distilled water and spritz it on your pillow. The sweet, floral aroma is a great cue to your mind and body that it’s time to settle down. Diffuse the Dream Blend 30 minutes before bedtime to help you unwind and relax. Transform your nightly routine into a moment of calm and focus by integrating Frankincense essential oil. Complex and woodsy, Frankincense is one of the best essential oils available for creating a peaceful and meditative space. When used topically, your beauty routine becomes more intentional, and you are able to give your skin the love and care it deserves. Highlight your natural beauty by creating a custom moisturizer when you add Frankincense essential oil to your night cream. Create calm and focus as you clear your head before rest by diffusing Frankincense essential oil during bedtime meditation practice. This powerful oil can be intimidating, with a complex aroma and a thicker texture than most essential oils; however, with Vetiver essential oil by your bedside, you’ll soon realize that it’s one of the best oils you can integrate into your nighttime routine. If you put on lotion before bed, add something new to the process. Combine a few drops of Vetiver oil with V-6™ Vegetable Oil Complex and massage into your feet for a deeply calming moisturizing moment. Create the perfect ambiance for relaxation by using the Serenity Diffuser Blend while you read before dozing off. Don’t go to sleep with tense muscles; it’s a near guarantee for a cranky morning. If you’ve accidentally read until the wee hours of the morning, or, whoops, watched a few too many episodes of your favorite show on your laptop, your neck and shoulders are likely in need of a mini massage. Keeping Deep Relief® Roll-On nearby eliminates the need to hop out of bed for relief. Use the cooling sensation of the Deep Relief essential oil blend, combined with the roll-on applicator, to pinpoint muscles that need extra attention. The base of the skull, neck, and shoulders can always use a little extra love. By now you’ve heard the benefits of using Lemon essential oil to refresh and clean, but have you considered the benefits it could offer kept near your bedside? Try using Lemon essential oil in your nightly beauty routine. 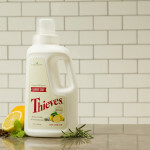 This oil is one of the best for helping to reduce the appearance of blemishes. You can also try adding it to your conditioners and hair masks, as it’s one of the best essential oils for making your locks look smoother and shinier! Instead of diffusing something sleepy, prep your diffuser for the morning! When you’re tempted to hit the snooze button, turn your diffuser on with this peppy blend instead. If the spa calls to you, you may be drawn to the uplifting scent of Eucalyptus essential oils. Though the rejuvenating scent can also be used to energize your mornings, when used as part of a relaxing massage, Eucalyptus essential oil can help you prepare for rest and relaxation. Breathe fresh! Like sleeping under the stars, a breath of clear air makes for a peaceful rest. Enjoy this uplifting experience by inhaling Eucalyptus Globulus essential oil directly or rubbing it on your chest. Help your muscles wind down by adding Eucalyptus Globulus essential oil to V-6™ Vegetable Oil Complex and using it in a relaxing foot massage. Try using a foot roller for added bliss. The sweet, woodsy aroma of Cedarwood essential oil is ideal for making bedtime your favorite time of the day. Use it for its gentle aroma or for its many topical benefits. Pamper yourself with an at-home scalp massage. Cedarwood is one of the best essential oils to use for hair treatments. 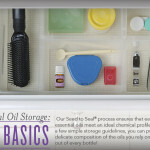 Warm a few drops between your hands and rub into your scalp for healthy-looking hair. Relax before bedtime with this earthy blend! 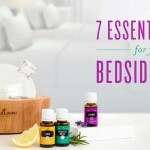 Now that you’ve prepped your bedside table, check out this post with more tips for your bedtime routine, then wake up with the 7 oils you won’t want to live without! 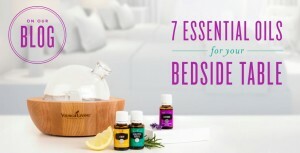 Which essential oils are your bedside buddies?